​ These one of a kind pieces are made from authentic wave tumbled ​​glass and pottery harvested from the waters of the Chesapeake Bay. Discarded and forgotten, the pieces have weathered the tides and storms of the Bay region. Gathered in the oyster tongs of a waterman or by carefully combing the hidden coves and exposed shorelines, these pieces tell a story of the area's history and people. ​We are grateful to our partner, Mother Nature. In Progress (awaiting resin) #97. Long mirror with Bay Glass and nautical chart. In Progress (awaiting resin) #96. Can you find the star? Square bottoms, medicine necks, and beautiful purples! In Progress (awaiting resin) #95. A rare piece. It is not often I find greens and sea foams with enough "cook time" in the Chesapeake Bay. In Progress (awaiting resin) #94. All blues! In Progress (awaiting resin) #93. Small pieces of purple, blue, and white. In Progress (awaiting resin) #92. In Progress (awaiting resin). #91. In Progress #90. The Chesapeake's iconic crab in authentic wave tumbled glass. Nautical chart includes the mouth of the Patuxent River. SOLD #89. Inspired by the little critters we find hanging on to our crab pots, this sea horse is made of gently tumbled green bay glass. The 1978 nautical chart in the background includes Solomons Harbor, the mouth of the Patuxent River, and Cove Point. 8 x 10. AVAILABLE #88. 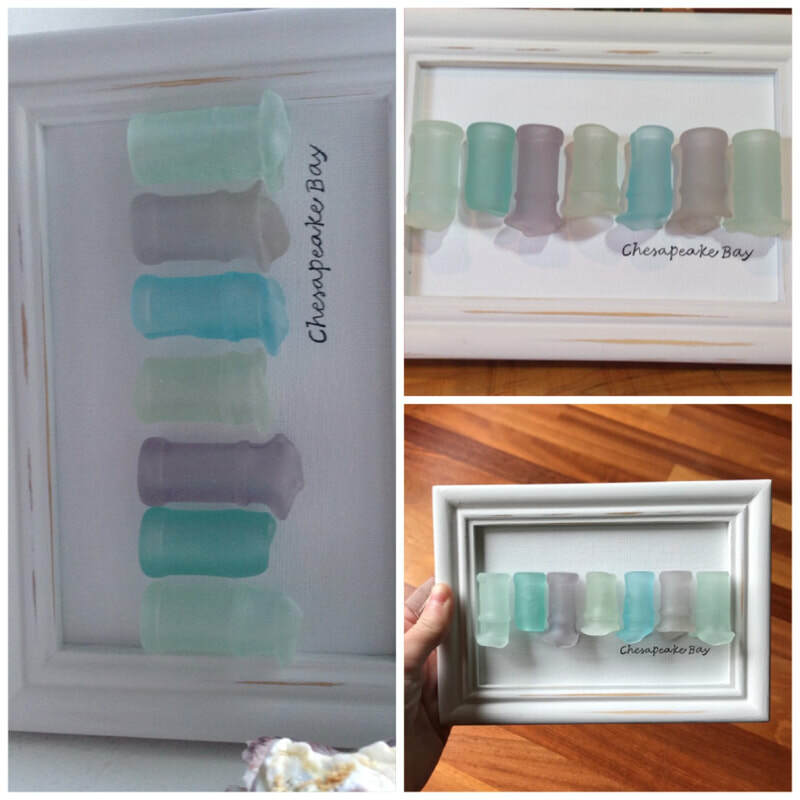 Bay Glassed Medicine Bottles. Cracked and broken but I could not cast these aside. The colors are beautiful! AVAILABLE #87. Patiently waiting. From the moment I saw it, I could not shake the idea that this piece looked like a little puppy. 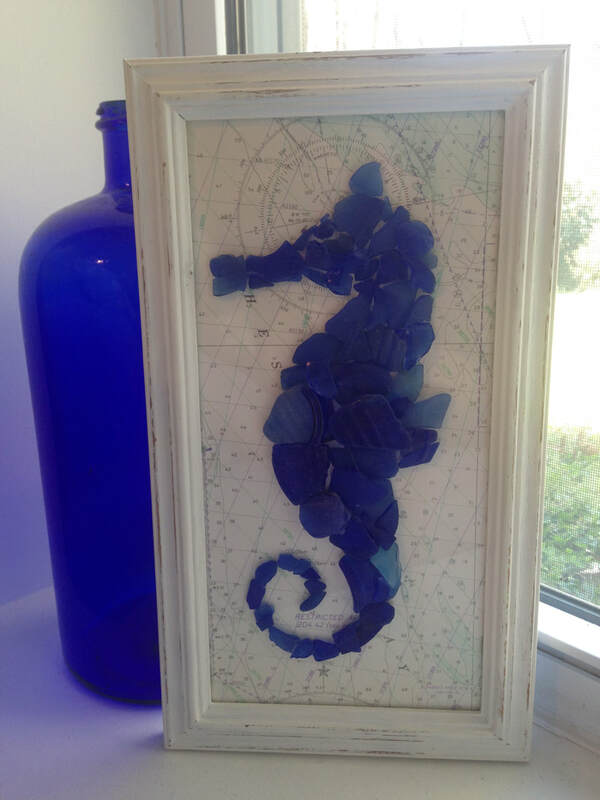 AVAILABLE #86 Blue Seahorse on Chesapeake Bay nautical chart. AVAILABLE #84. Small key rack. 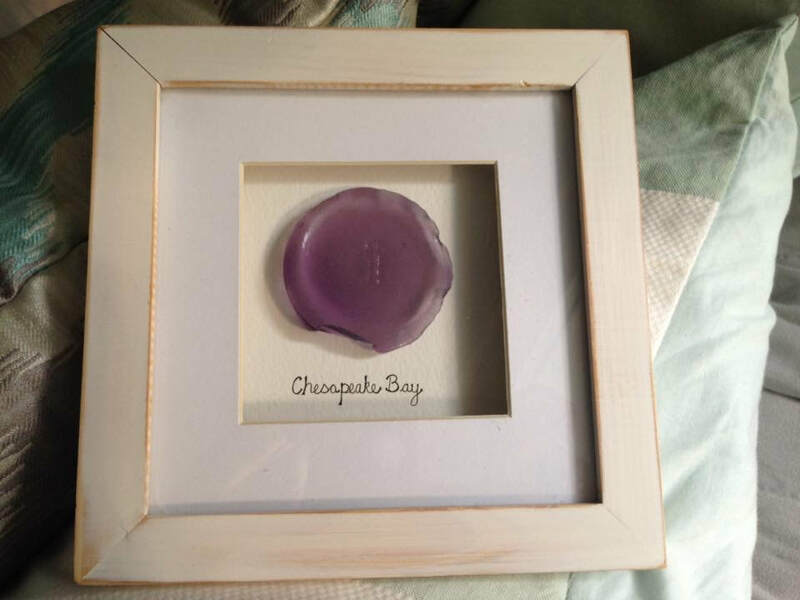 Customize it with a photo of your favorite Chesapeake Bay Beach. All glass is beautifully tumbled. Colors include sea foam, white, purple, and aqua. AVAILABLE #81. Tumbled purples and cut glass. 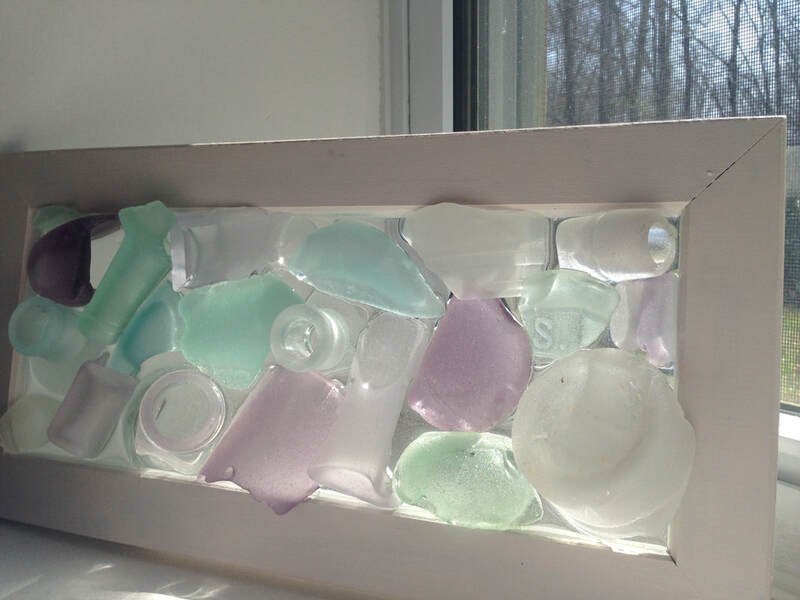 Soft purple edges and bright cut glass. Can be displayed vertically or horizontally. AVAILABLE #80. Greens, blues, purple, and white. 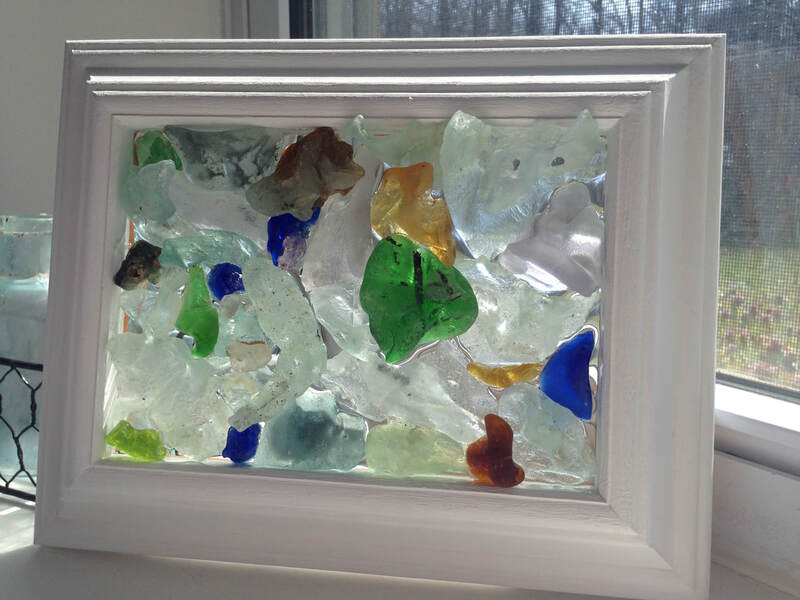 The glass is naturally tumbled by the Chesapeake Bay and Patuxent River. AVAILABLE # 73. A Sun Colored Amethyst (SCA). Originally the bottom of a baking powder bottle, the clear glass turned purple when exposed to the sun. 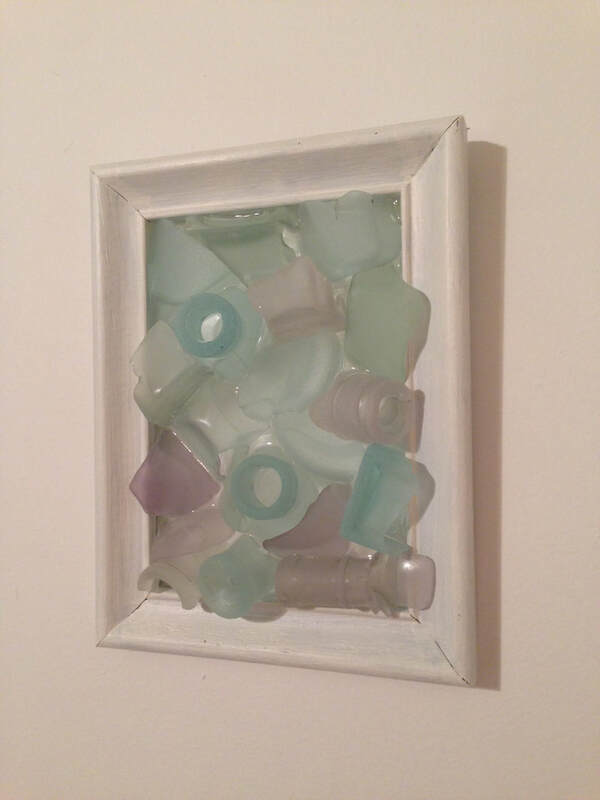 Love the feel of sea glass? This piece lets you run your fingers over the glass any time you want! AVAILABLE #70. 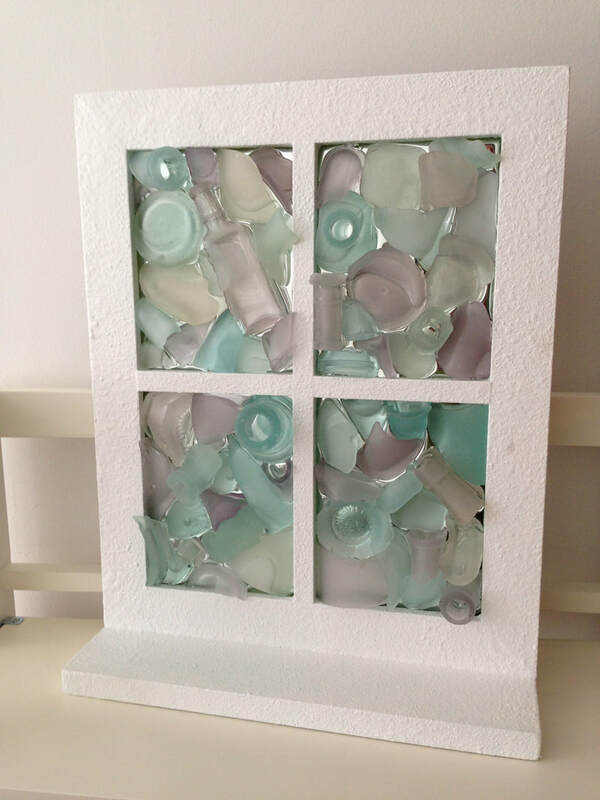 Upcycled window replica with textured paint. Beautifully tumbled pieces in a range of colors. 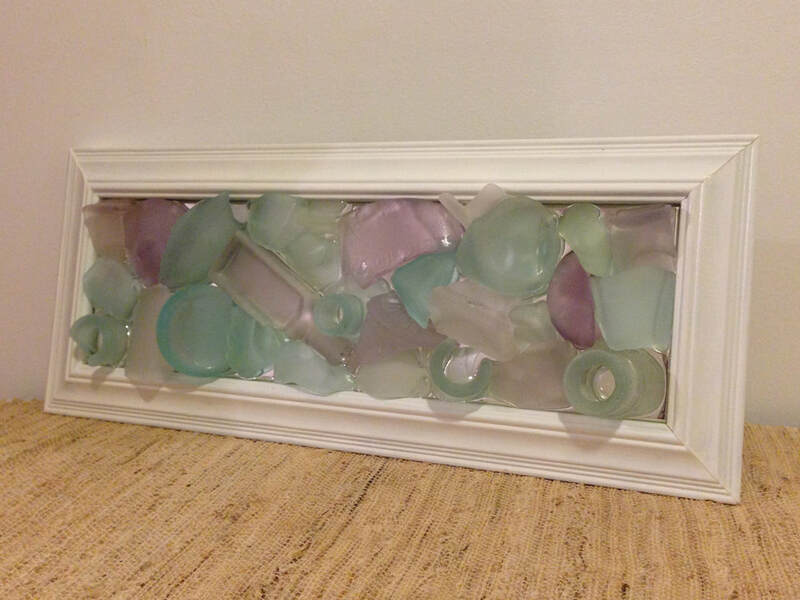 All glass is Bay tumbled with soft edges. AVAILABLE # 68. 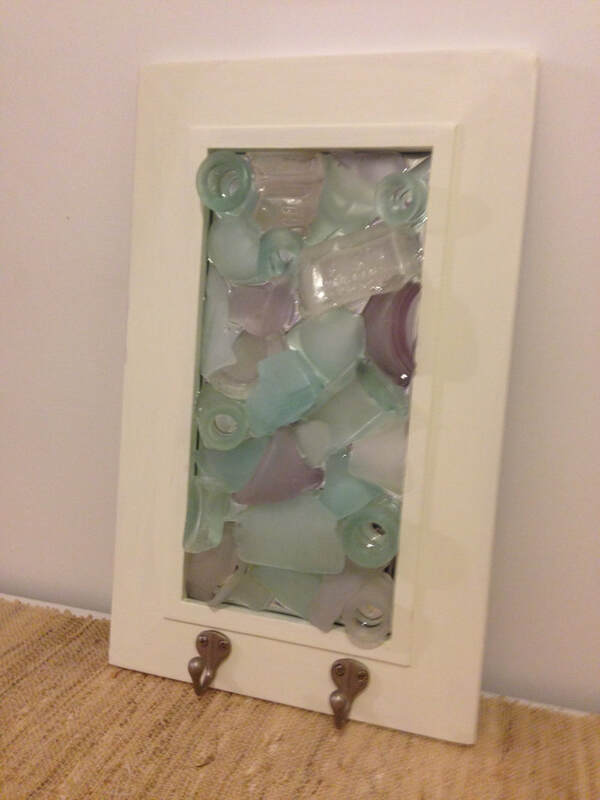 Upcycled Bay Glassed mirror with key hooks. Would make a great entrance way piece. 16h x 10w. AVAILABLE # 65. Upcycled twice. From window to mirror to Bay Glassed! 20 x 20. Beautiful colors. Necks, shoulders, and bottoms. AVAILABLE #57. Bay Glassed octagon. Blue bottle side in center reads, "James Bailey & Co. Baltimore, MD." "Pat" is written on bottle at top. Mirror backing gives extra shine! AVAILABLE #55. Blue bottle side says, "Brooklyn This Bottle Not For Sale." "Balt and Parlin," "Shrew," "Colette," "OK," and "Parlin" can be read on other pieces. Frame size 22 x 13. AVAILABLE #54 Purple, blue, green, and champagne. Bottle fragments read "Nurser," "Pottsville, PA Co Inc," "Yuengling & Son Inc 30." Frame size 22 x 10. AVAILABLE Basket #2. Mermaid on a salvaged basket bottom with up-cycled Mother of Pearl buttons. 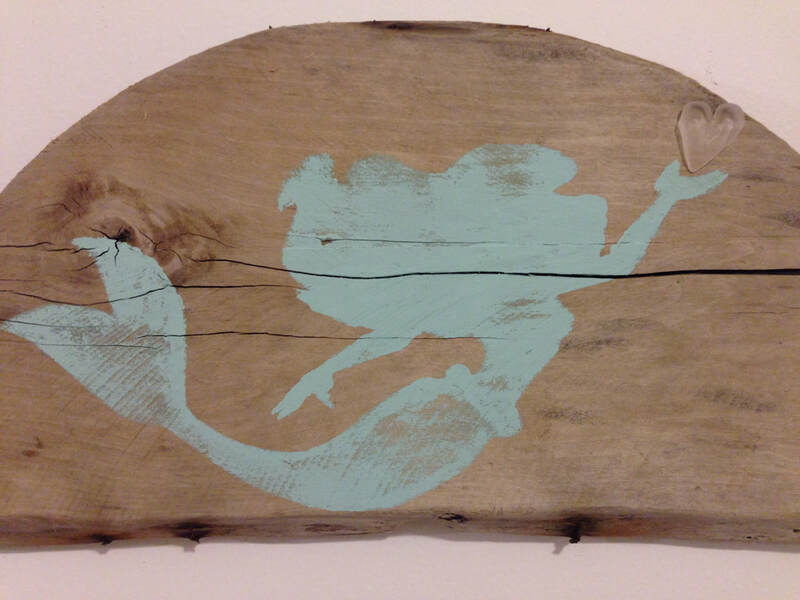 Painted in Solomon's green the mermaid is holding our favorite Bay shell, a periwinkle. AVAILABLE #53 Asprin bottle. 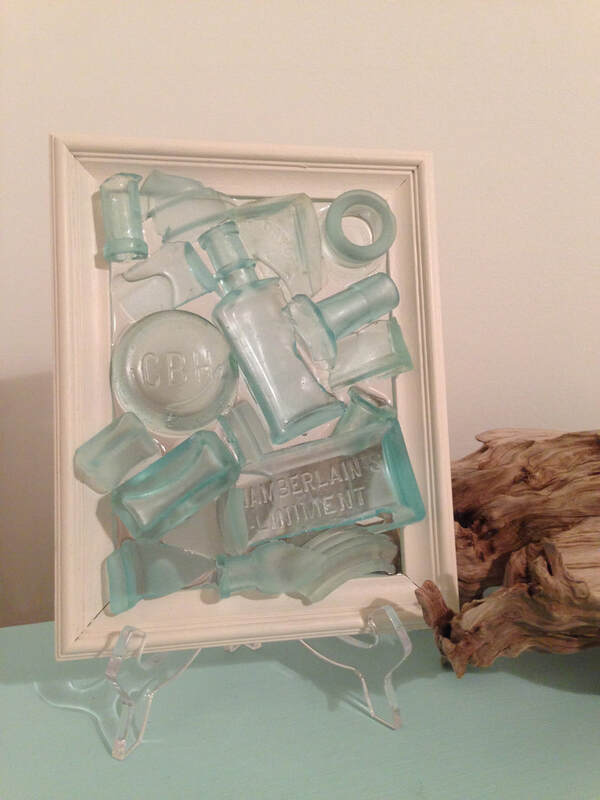 A recognizable Bayer Asprin bottle is at the heart of this piece. 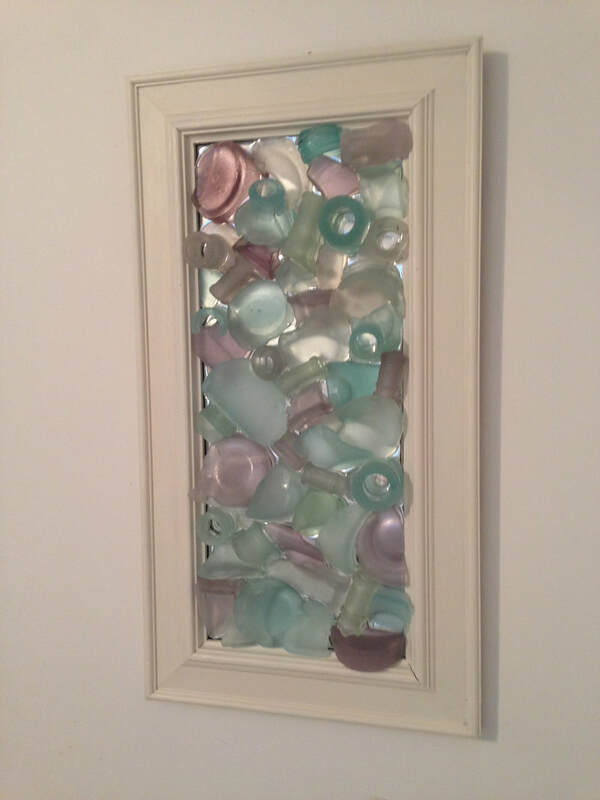 All colors are represented and each piece is gently rounded, genuine bay glass. White frame. 9 x 7 frame size. In Progress #99. Custom order. Dog Silhouette. In Progress #98. Custom order. SOLD #89. Tangier found medicine bottle. SOLD #79. Gently rounded pastel pieces. Can be hung on wall or as a sun catcher. SOLD #78. Purples, greens, and blues! All bay glass. 5 x 7. SOLD #85. Medicine Bottle Necks! SOLD #77 Long mantel piece in distressed white frame. Soft purples, greens, and aqua colored glass. SOLD # 74. 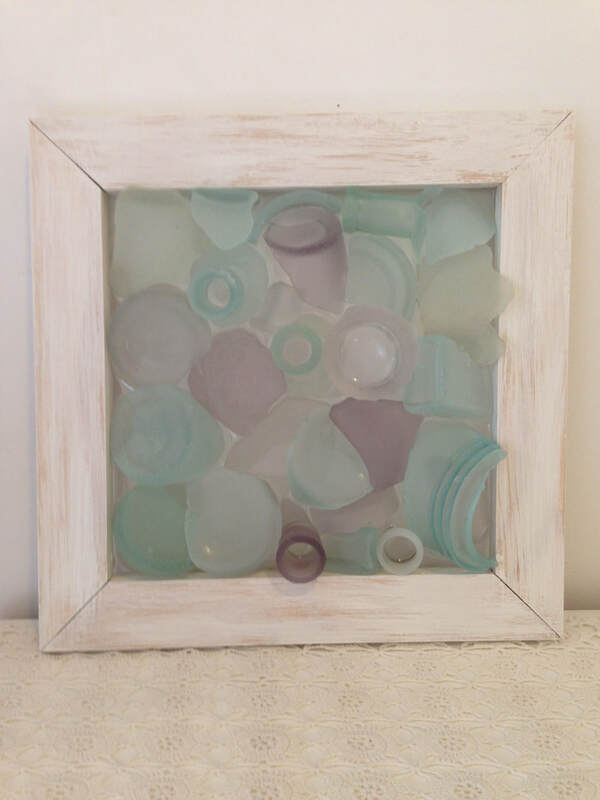 Aqua bay glass set in a small distressed frame. SOLD #76 Soft colors. Blues, purples, and greens. "150", "J8". Set in a 5 x 7 distressed white frame. SOLD # 75. Royal blue and white. "Hoyt's Nickel Cologne" "Phillips" "USA". 5 x 7 distressed frame. 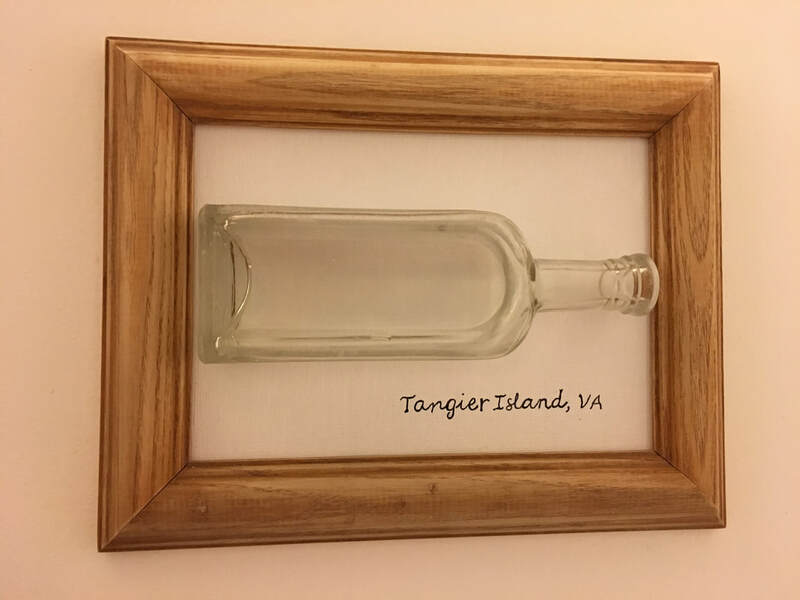 SOLD #72 This piece was custom ordered to highlight a beautiful medicine bottle found by the client while exploring the Chesapeake Bay. SOLD # 71. Bay Glassed Mason Jar Jellyfish. The body of this jellyfish is made with the bottom of a Mason jar. The tentacles are purple pieces accented with the edges of oil lamp globes. SOLD # 69. Bay Glassed Crab. Tumbled browns make this iconic Chesapeake Bay symbol. SOLD # 67. Original Bay Glassed sun catcher. "Log Cabin" syrup bottom is the centerpiece. SOLD # 66. 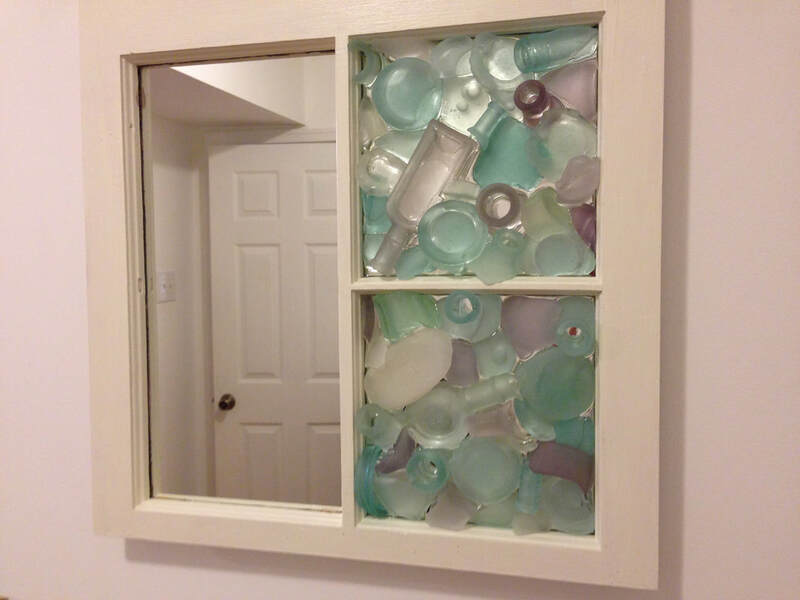 Upcycled 6 pane mirror. 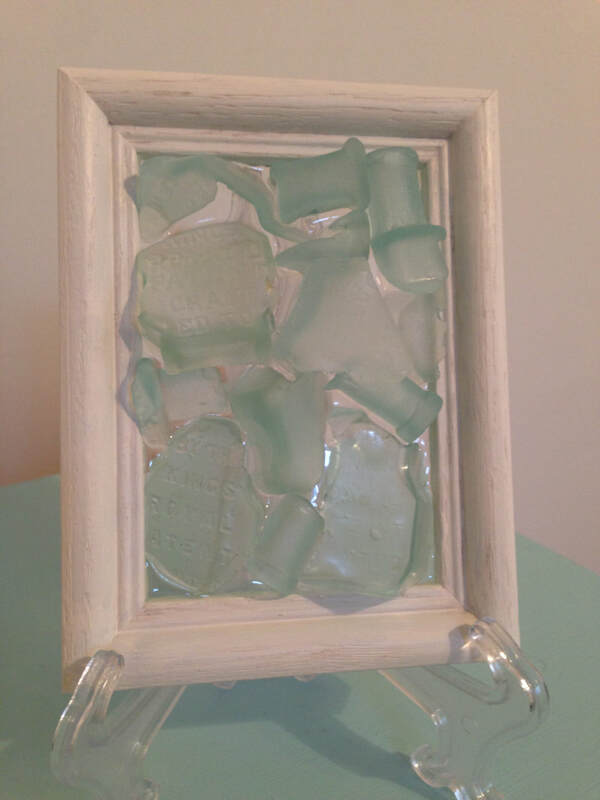 Off-white crackle paint emphasizes the beautiful glass in this piece. 17.5 x 12. SOLD #63. Small square sun catcher. Mixed colors. SOLD #62. 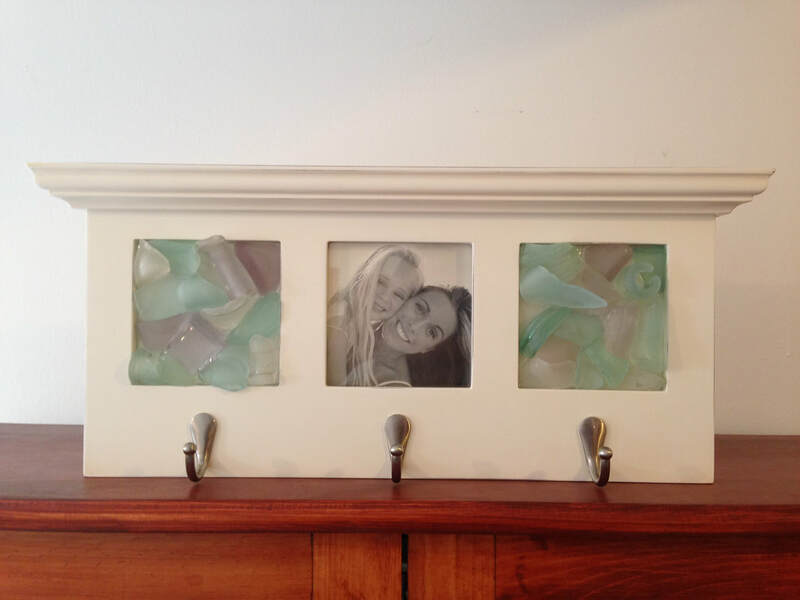 Bay Glassed picture frame. 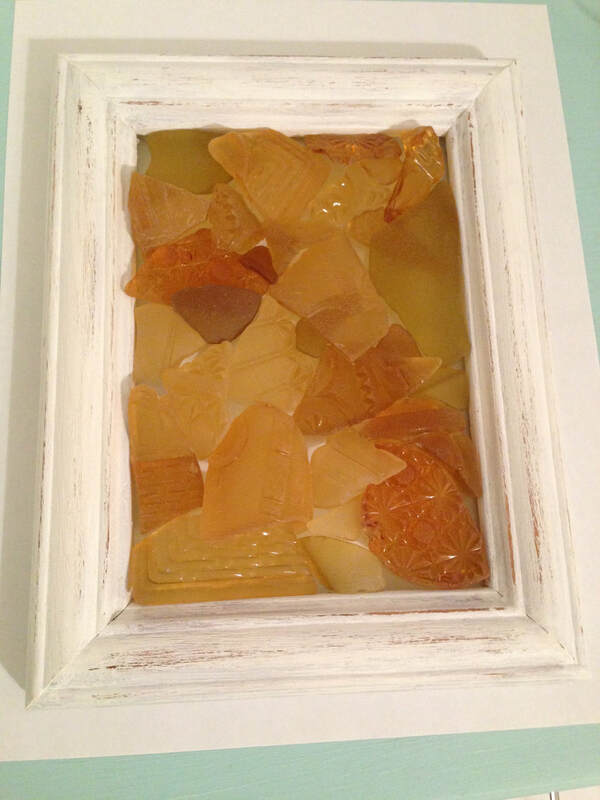 Glass fragments read, "Straus Co. Sole Prop Richmond." Glass mirror measures 10 x 7.5. Total size is 18.5 x 15.5. 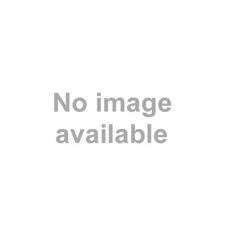 Holds four pictures. SOLD #61. Large mirror backed design. "MFC Chemist" written on purple bottle side. Center piece is a purple medicine bottle. Measures 18 x 8. SOLD # 60. 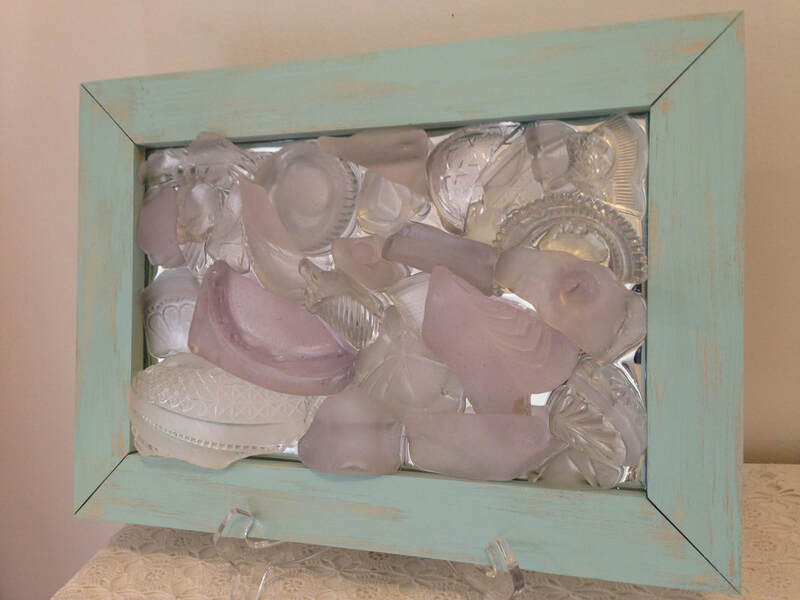 Deep mirror box filled with bay glass. Greens, blues, purple and white. Measures 13.5 x 5. SOLD #58. Bay Glassed bottle gently tumbled. Shards of green and blue. Can be wall hanging or sun catcher. SOLD #56. Sun catcher in dry brushed frame. Words "Figs," "210," "Sparil," "Pat," and "Nov 16." Frame size 11.5 x 11.5. SOLD. Seahorse #2. All pottery was found locally in the waters of the Chesapeake Bay and hand placed. "Chesapeake Bay" is handwritten in the bottom corner. A spat (baby oyster shell) accents the piece. frame size 13 x 13. SOLD #52. These hand picked pieces are stunning! Very unique purple pieces and Solomons greens. Beautiful when displayed in a window or on a white wall. 14 x 7 frame size. SOLD # 50 Turlington bottles. 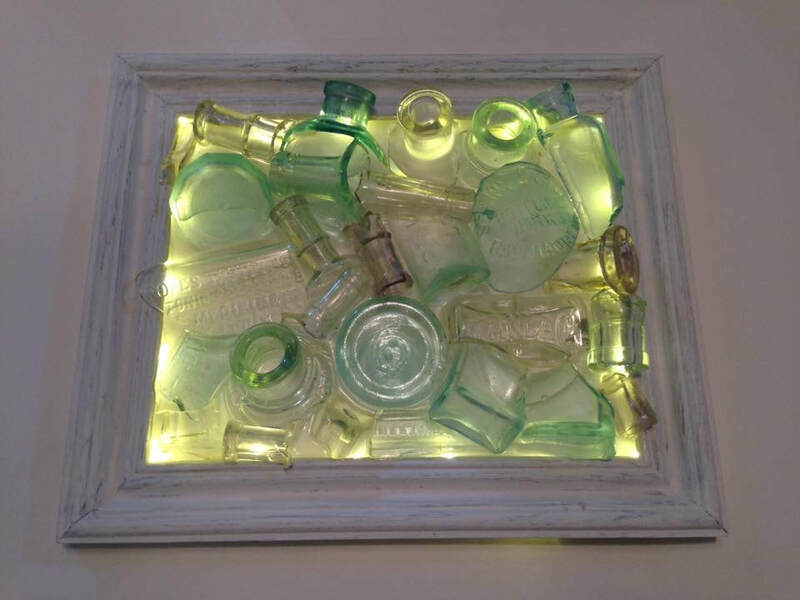 This piece is made exclusively of Turlington medicine bottles. 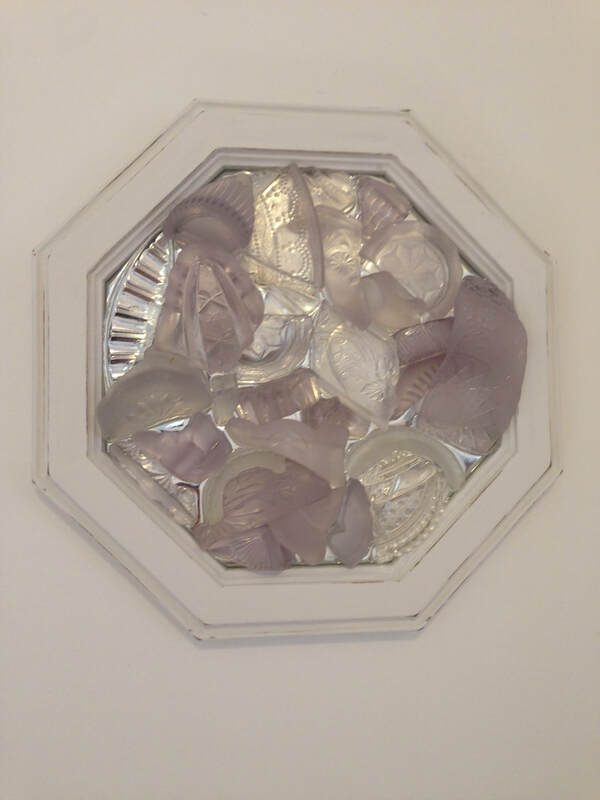 The center piece is shaded purple and words of the original phrase "By the Kings Royal Patent Granted to Robt Turlington for his invented balsam of life" can be seen on the surrounding pieces. Various color shades are represented. 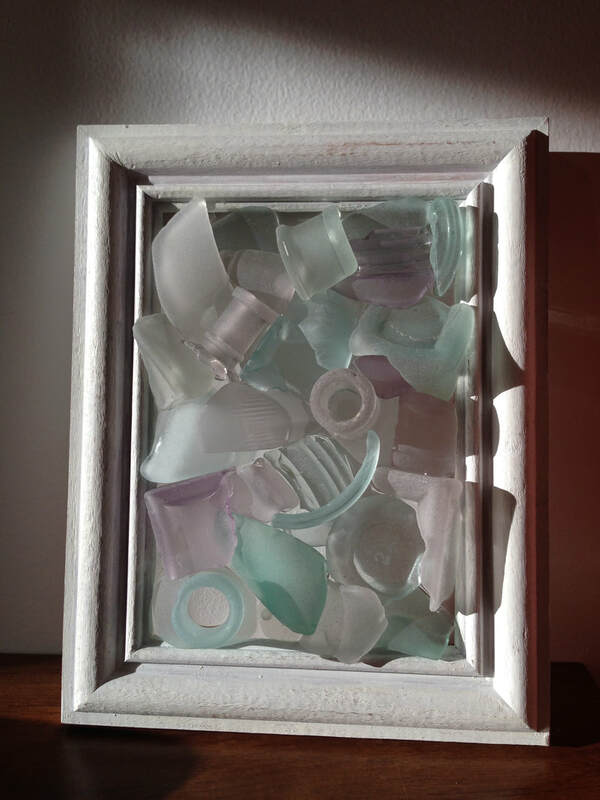 SOLD #51 Bonfire bay glass. Yellow, amber, cobalt, green, aqua, and champagne. The forces of fire and water came together in this unique piece. SOLD. 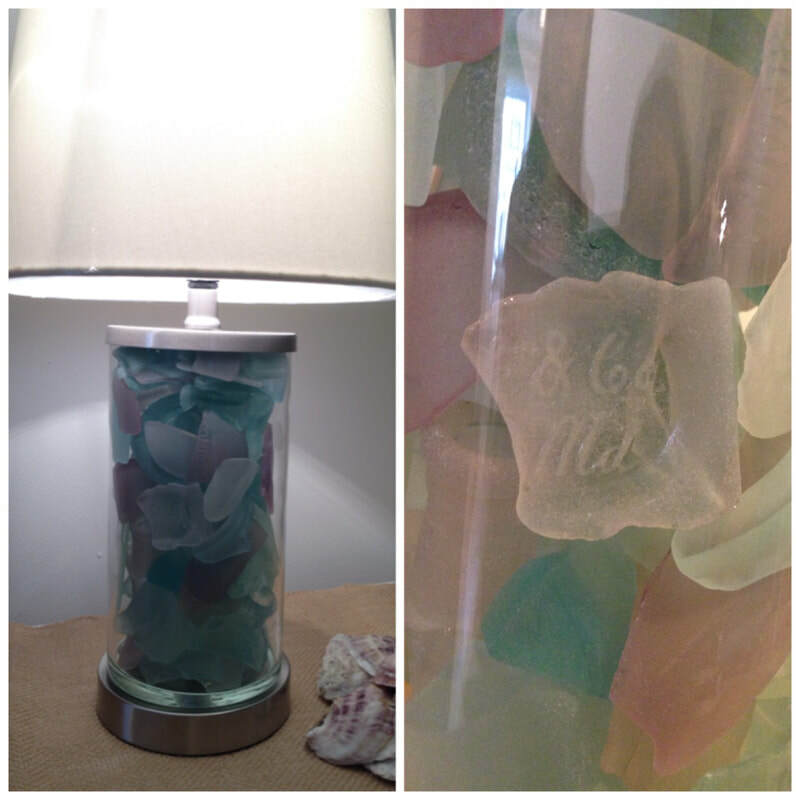 Bay Glass Lamp #2. 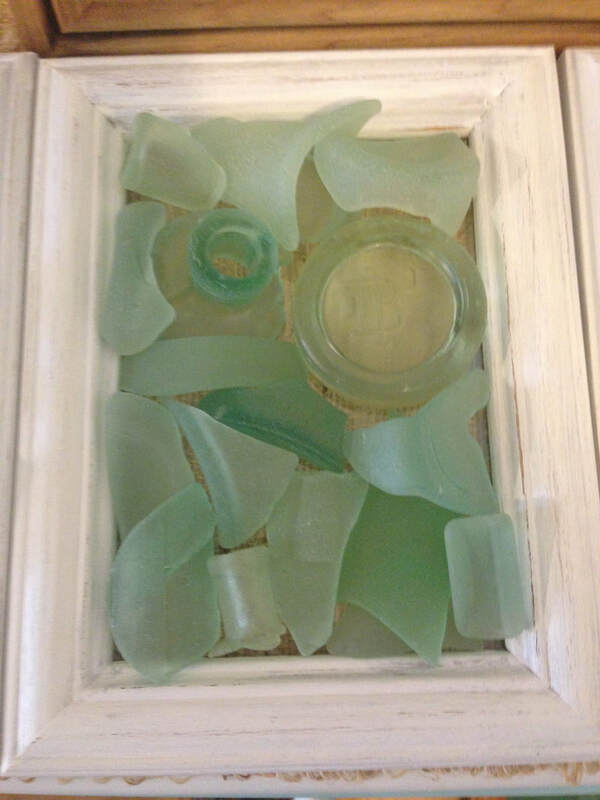 Beautiful sea glass gently tumbled. Nickel finish. 13.25 inches (H) x 5.0 inches (W) x 5.0 inches (D), not including shade height. 5 ft cord. Includes lamp shade. SOLD # 49 Pearly blues. 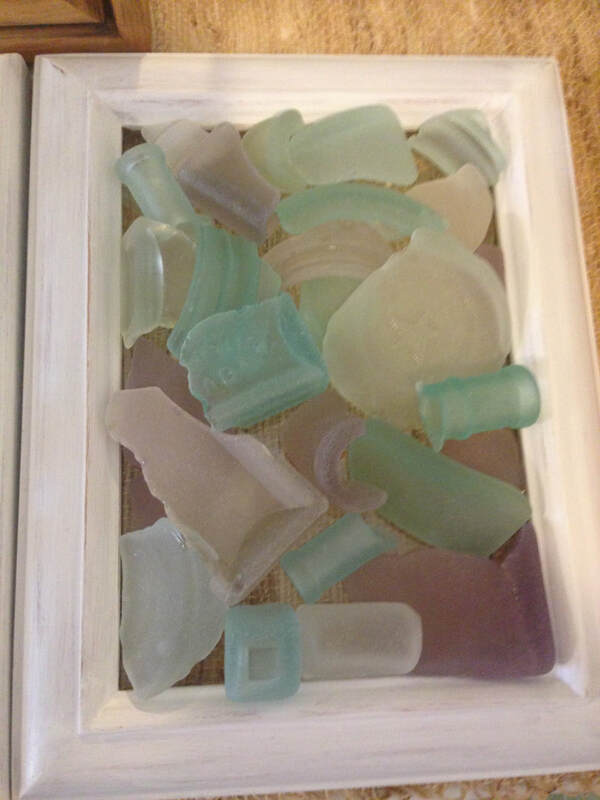 These gently rounded pieces of bay glass show the distinctive "c" marks of genuine sea glass. The bottle bottom says, "S & Co." and the bottle side says, "James Bailey & Son Baltimore." "Maso" can be seen on the Mason jar lid in the upper left hand corner. 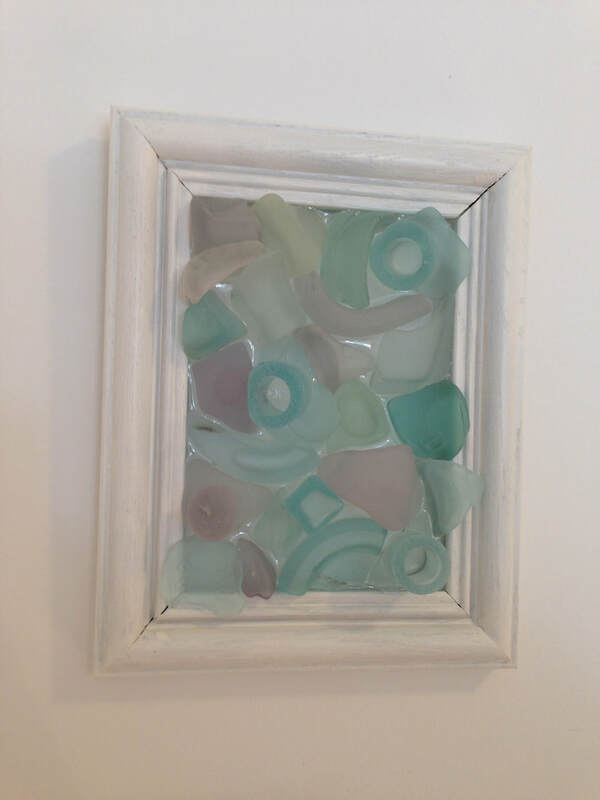 This small piece displays well in a window or on a white wall. Frame is painted antique white. SOLD #48. Bay Glassed Anchor. 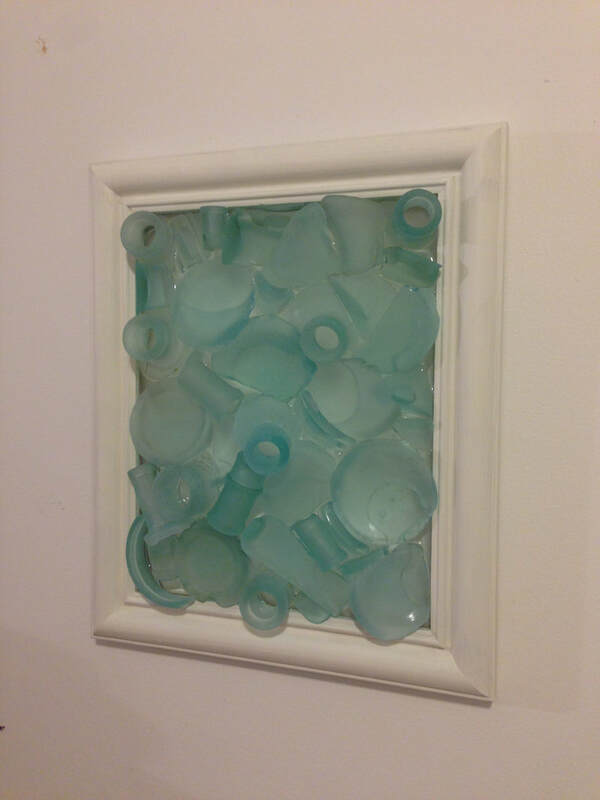 This piece can be hung on a wall or in a window. 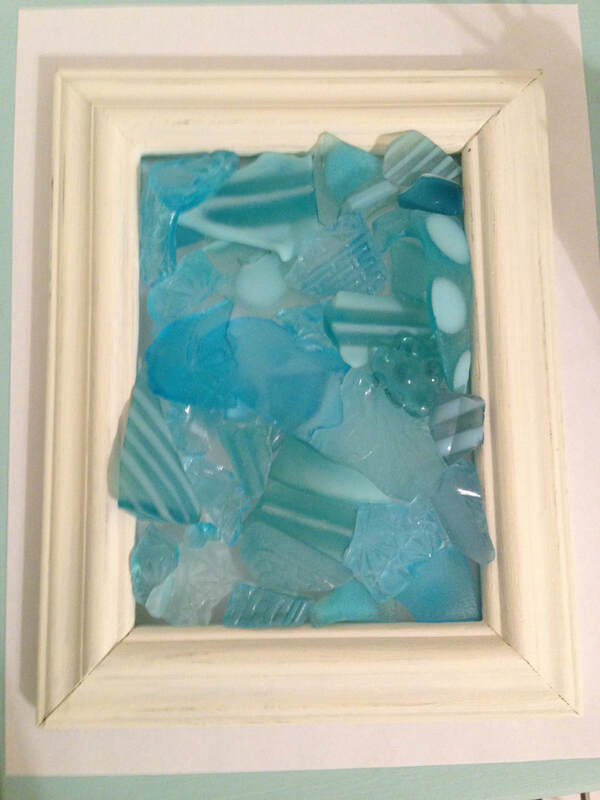 The blue glass is bonfire glass turned sea glass. It is stunning! A starfish is added for accent. 11.5 x 11.5 frame size. Frame is dry brushed. SOLD #47 Medicine bottle necks. "Chesapeake Bay" Beautiful pastel colors lined up on a canvas background. SOLD #46. Something different! 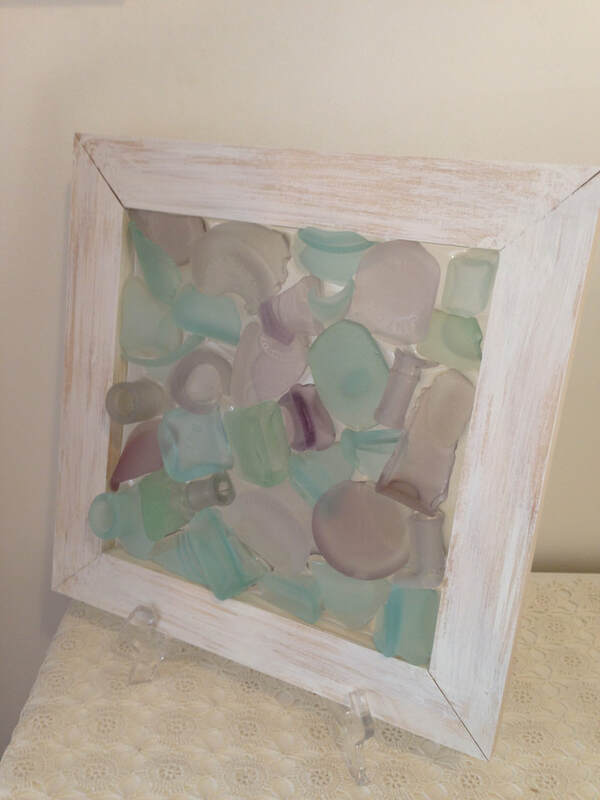 Bay tumbled purple and white with a smattering of clear glass. Set on a mirror and in a "Solomons green" frame. Frame is dry brushed for a beach feel. HOLD #45. 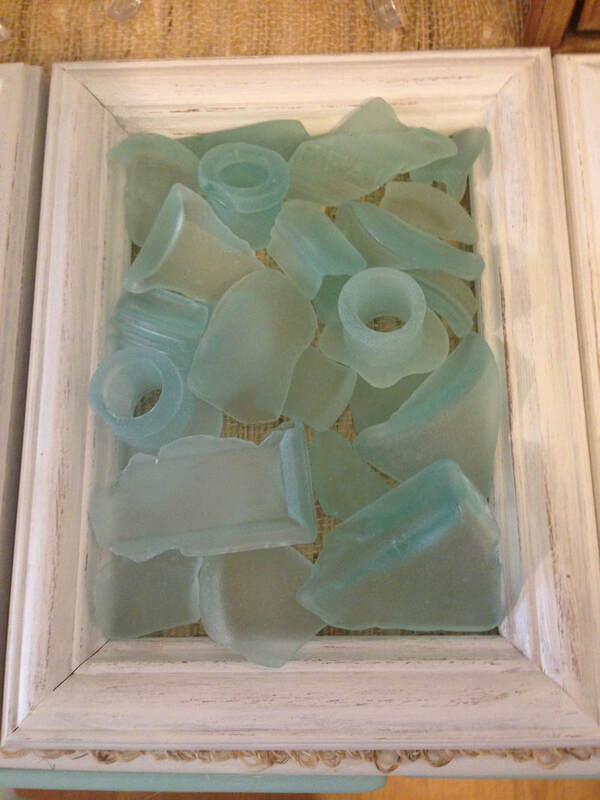 Beautiful sea glass gently tumbled. Displays best in softly lit window or on white wall. Frame size 11.5 x 11.5. Frame is dry brushed white. SOLD #44 Purple, aqua, greens, and whites all show the deep "c" pattern of authentic, wave tumbled glass. 11.5 x 11.5 frame size. Frame is dry brushed for a beach look. SOLD. 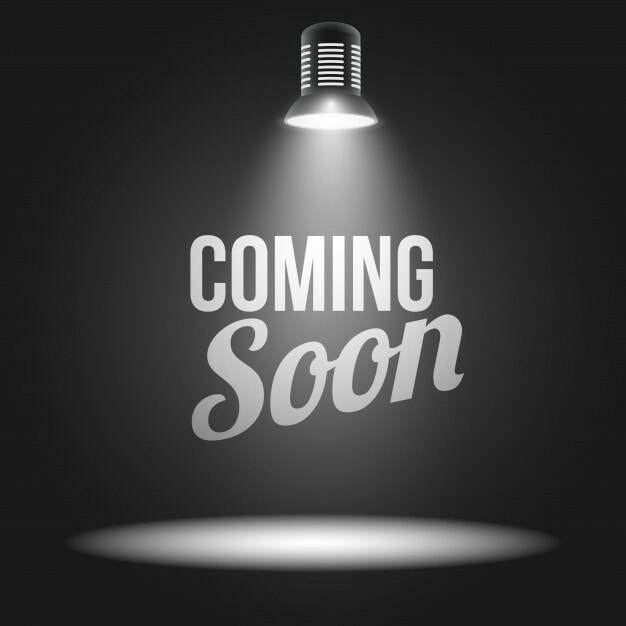 Lamp #6. Barnacle Lamp. Bay tumbled and home grown barnacles. Includes lamp shade. SOLD #43. Green, purple, aqua, and teal. All edges beautifully rounded. 6 x 4.5 frame size. 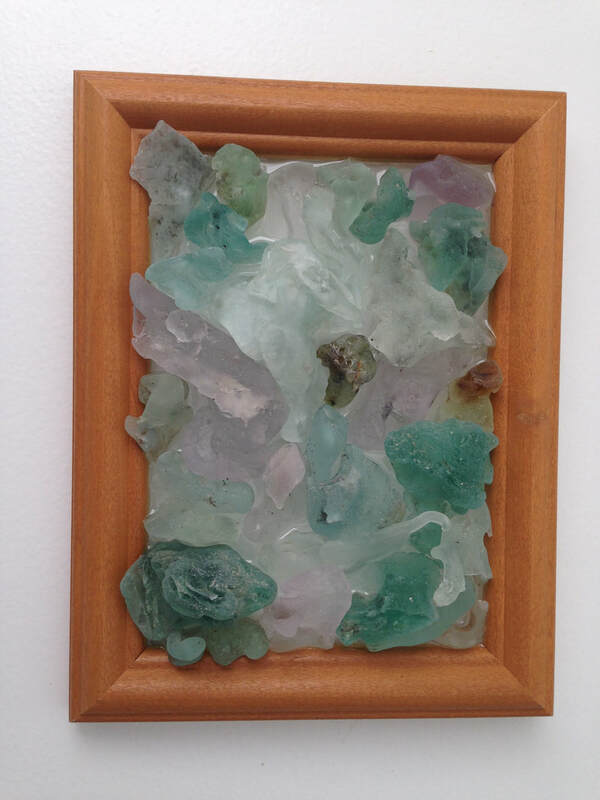 SOLD #42 Beautiful purples, greens, and aquas deeply tumbled. Pieces show authentic "c" pattern only visible on authentic glass. Dry brushed frame adds to the bay side look. 11.5 x 11.5 frame size. SOLD #41. Stop! This mirrored octagon is a show stopper! 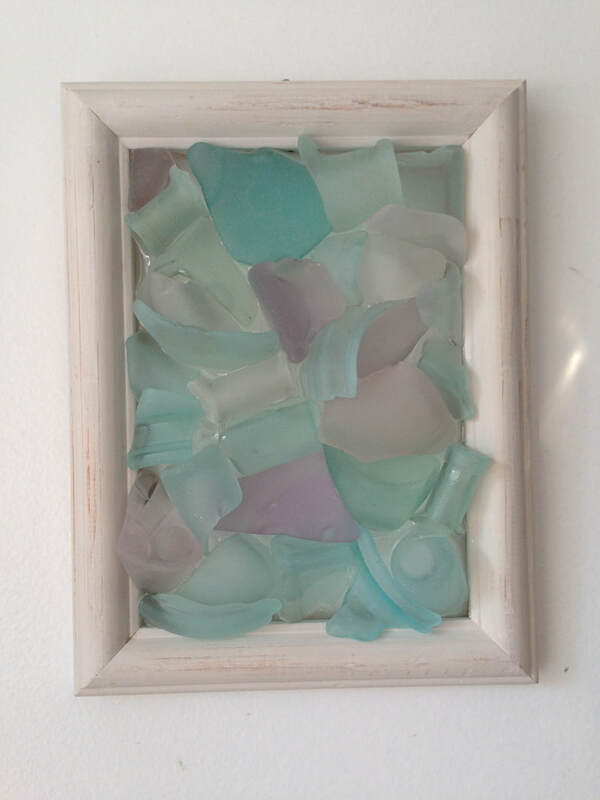 Made of shards and gently tumbled sea glass. This piece reflects light beautifully. SOLD #40. 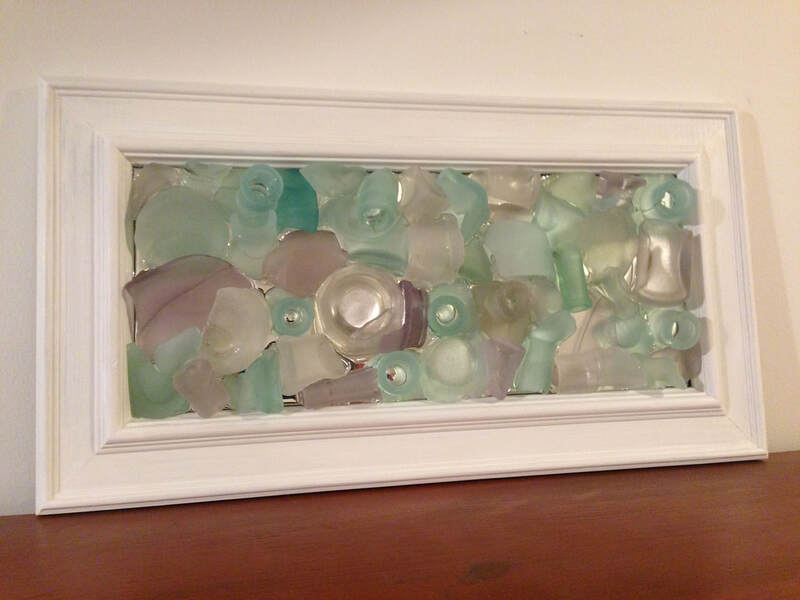 Deep frame holds antique cut shards and sea glass. Mirror backing adds back lighting for extra shine. 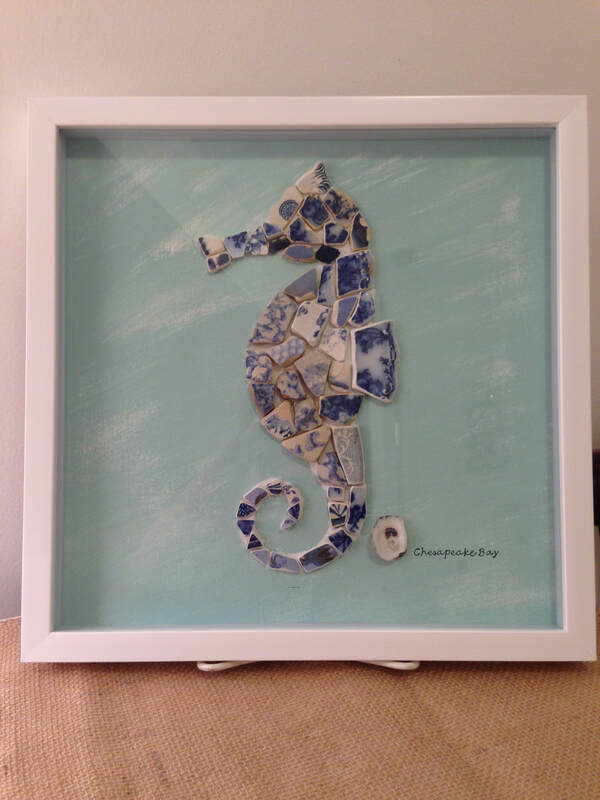 SOLD- The perfect Bay tumbled pottery came together to make this little guy. The periwinkles are familiar to anyone who grew up on the creeks of the Chesapeake Bay. SOLD- Bay Glass Lamp #1. 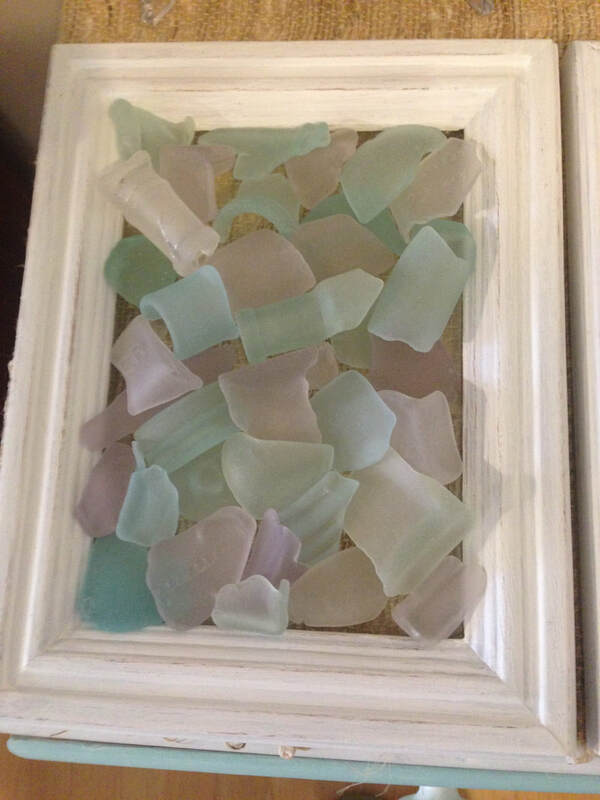 Beautiful sea glass gently tumbled. Nickel finish. 13.25 inches (H) x 5.0 inches (W) x 5.0 inches (D), not including shade height. 5 ft cord. Includes lamp shade. SOLD #39. Aqua, green, purple, and white. Necks, bottoms. and sides. SOLD #38 This unique piece is made of bonfire glass tumbled in the surf! It contains aqua, purple, brown, white, and green. 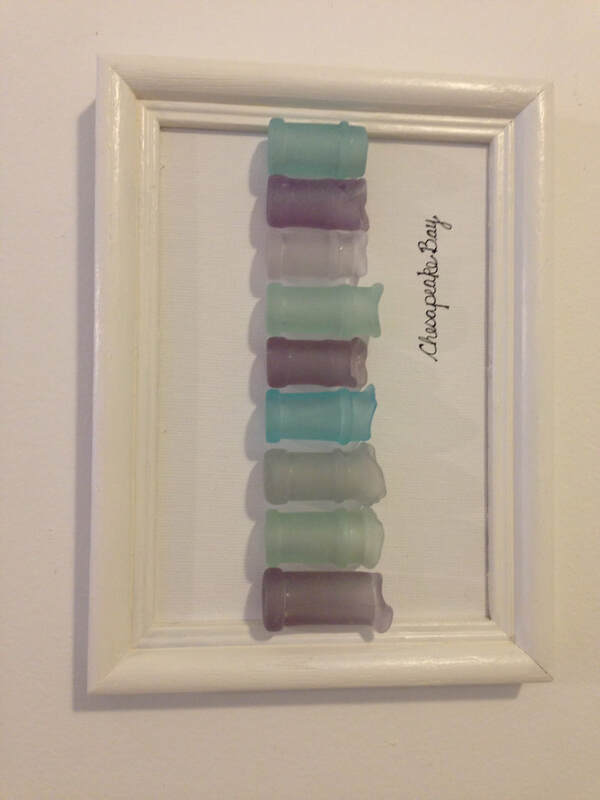 SOLD #37 Softly rounded blue, green, purple, grey, and white bay glass. 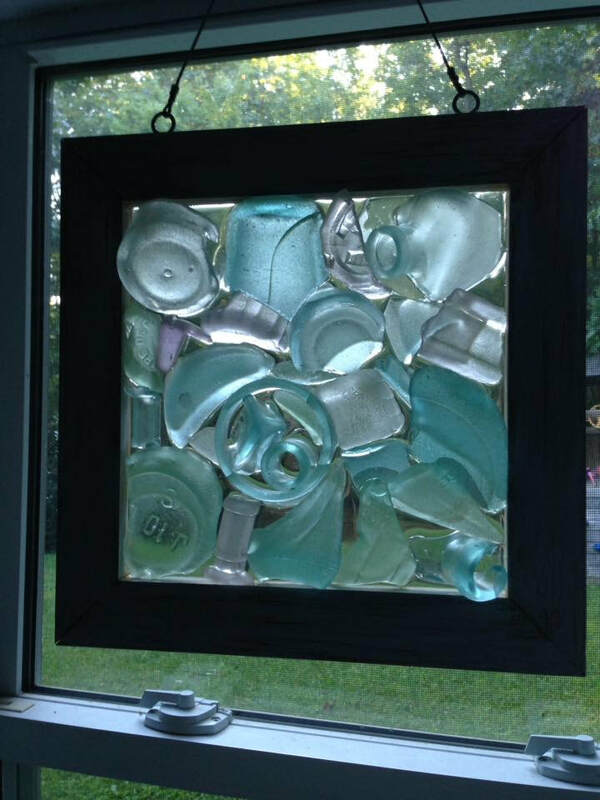 Can be hung as a sun catcher or displayed on a white wall. 13 x 7.5 frame size. 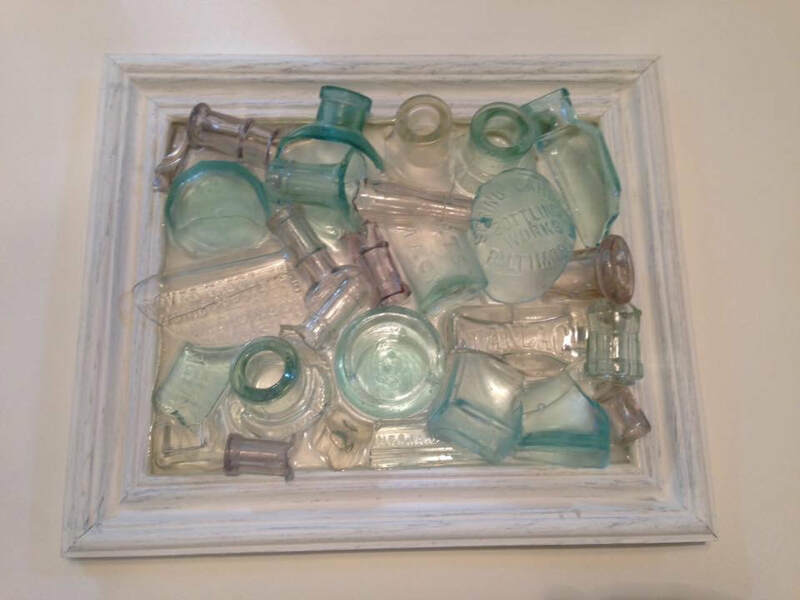 SOLD #36 Each piece is from Robert Turlington's Balsam of life bottles. Thesep bottles were most prevalent in the early 1900's. "Granted To," "Royal," and "London" are visible on the gently rolled pieces. 6 x 4.5 frame size. SOLD #35. Stunning! Distressed white framed mirror. Beautiful colors reflect light. 19.5 x 10.5 frame size. SOLD #34. Square mirror with antique flair. The mirror allows light to reflect through the glass. 10 x 10 frame size. 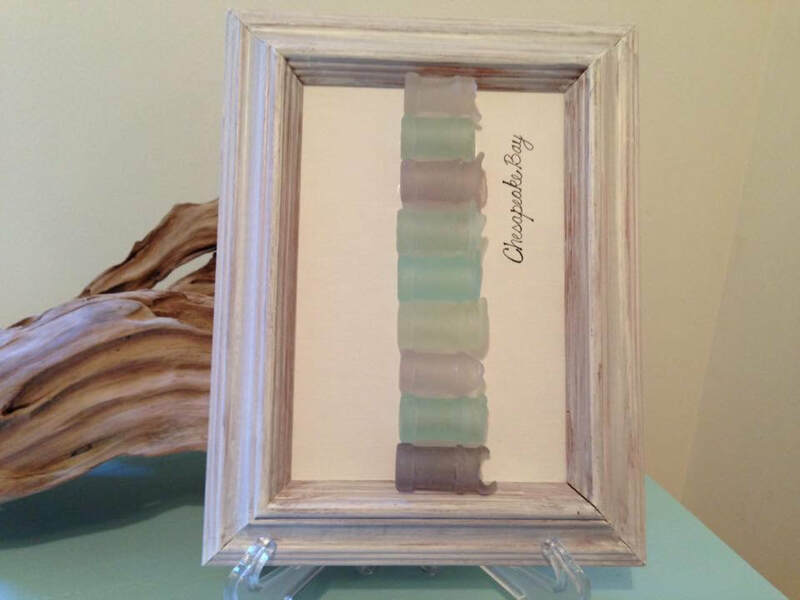 SOLD #33 Tiny pieces of opalescent glass. Some orphan pieces, colors unlike any other are blended in. Small distressed frame. 5 x 6 frame size. SOLD #32. This small piece contains tiny square bottle bottoms, the purple skeleton of a Robert Turlington bottle, and little round bottle bottoms. 8 x 5 frame size. SOLD #31 Back by popular inquiry! 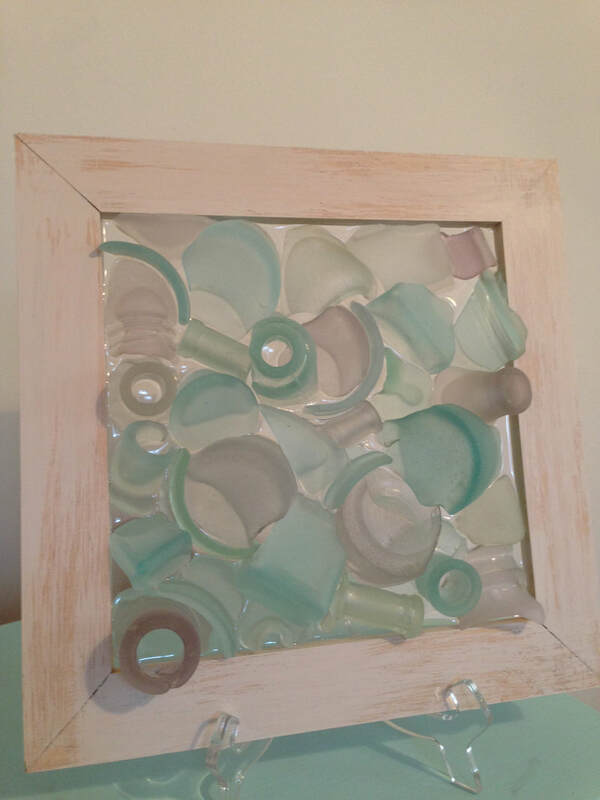 Bay Glassed sun catcher in handmade frame. "Distressed" look. Greens, blues, and purples! Includes a partial sea foam green ink well. 11.5 x 11.5 frame size. 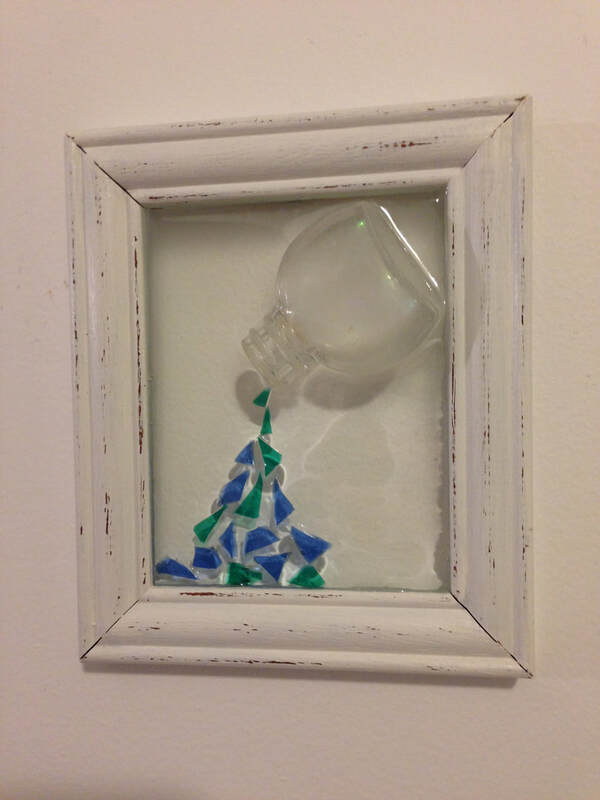 SOLD #30 Medicine bottle necks. Softly rounded edges. Blues, greens, whites, and purples! 8 x 6 frame size. 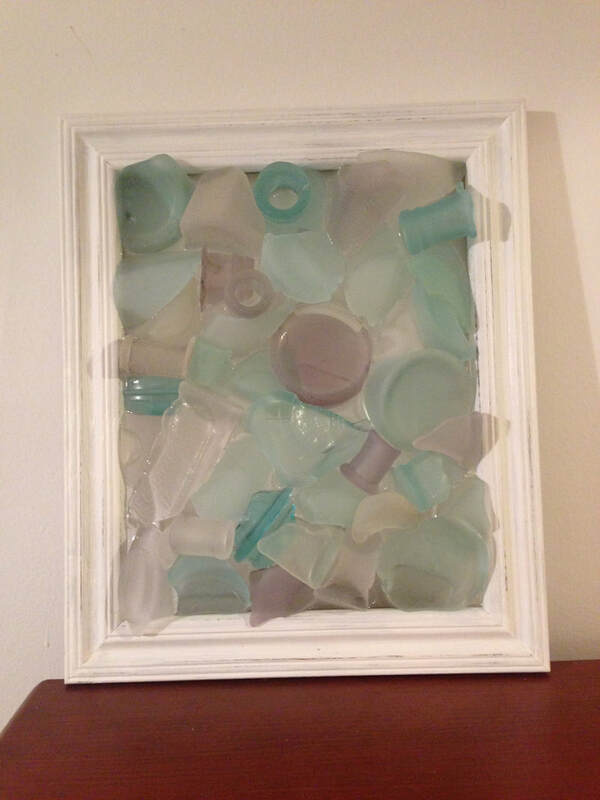 SOLD #29 Aqua bay glass from baking soda and medicine bottles. 8 x 10 frame size. SOLD Lamp #5 Bay Glassed lamp. Purples, blues, greens, and champagne colors. "& co. MD" is on piece at front of lamp. Small white shade included. SOLD #28. Opal blues! Medicine bottle pieces read "Chamberlain's Liniment," "GBH," and "Davidson." 8 x 6 frame size. SOLD #27 Purple, green, aqua, and white. All edges are gently rounded. Mounted in a distressed frame. SOLD #26. Purple, green, aqua, and white. All edges are gently rounded. Most popular size! 8 x 6 frame size. 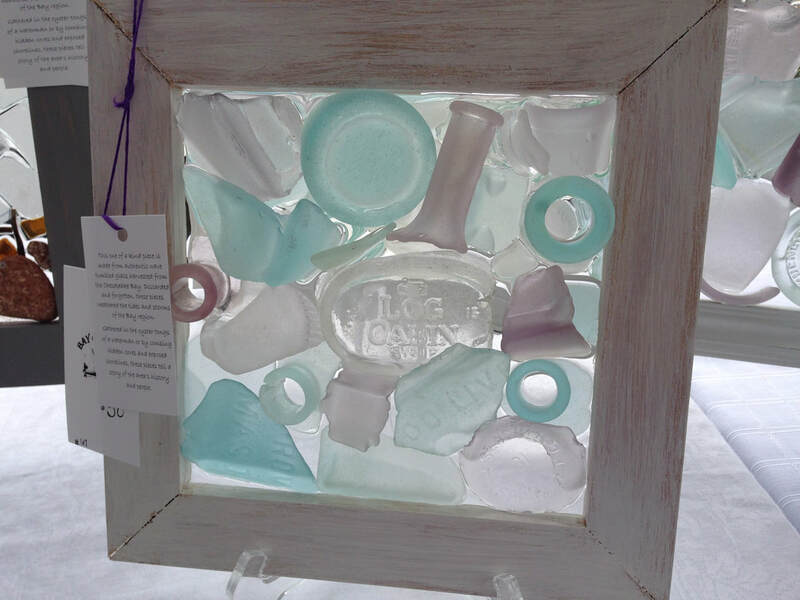 SOLD #25 Purple bay glass and clear shards. This piece reflects light beautifully. 8 x 6 frame size. 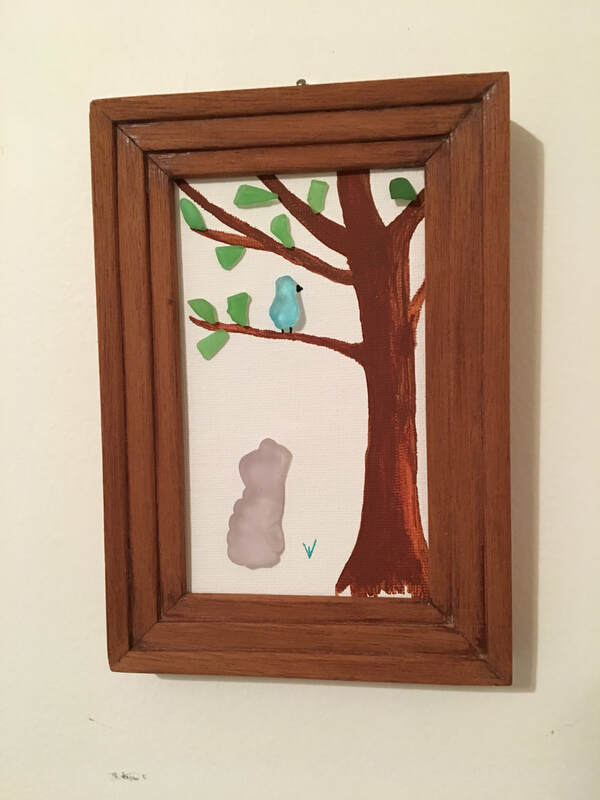 SOLD # 24 Two ways to display! Hardware is mounted for horizontal or vertical hanging. First mirror-backed design. 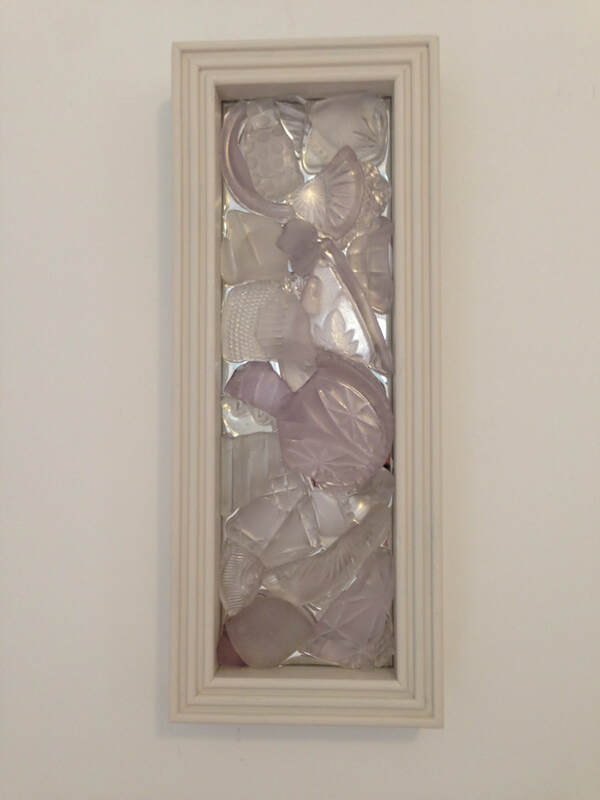 The mirrored backing pushes light through these white and purple bay glassed pieces. Hardware is in place to hang horizontal or diagonal. 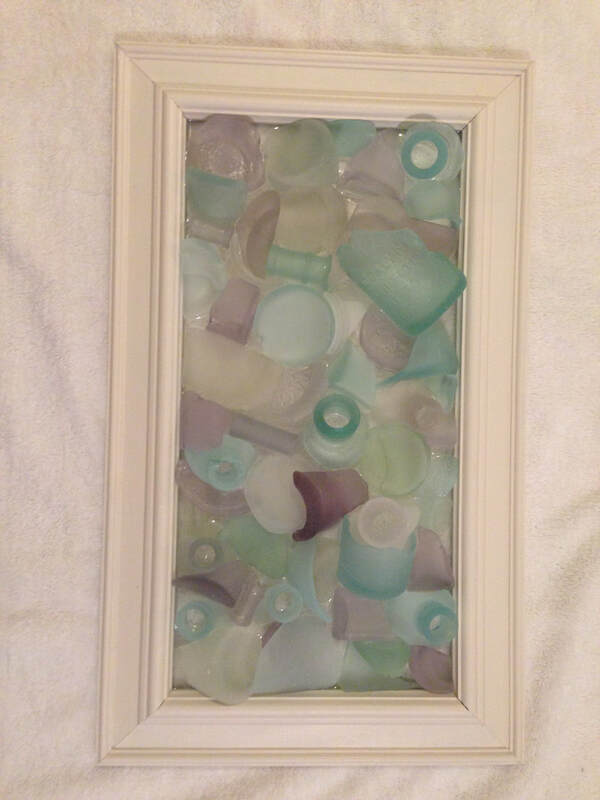 SOLD #23 Purples, greens, and aqua bay glass. All edges are gently rounded. 8 x 6 frame size. SOLD #22 Green, aqua, and purples. All edges are gently rounded. 8 x 6 frame size. SOLD #21 A purple river in banks of blues. This piece can be hung on a wall or as a sun catcher. 8 x 6 frame size. SOLD #20 All soft edges. Purple, blues, whites, and greens. 17 x 9 frame size. 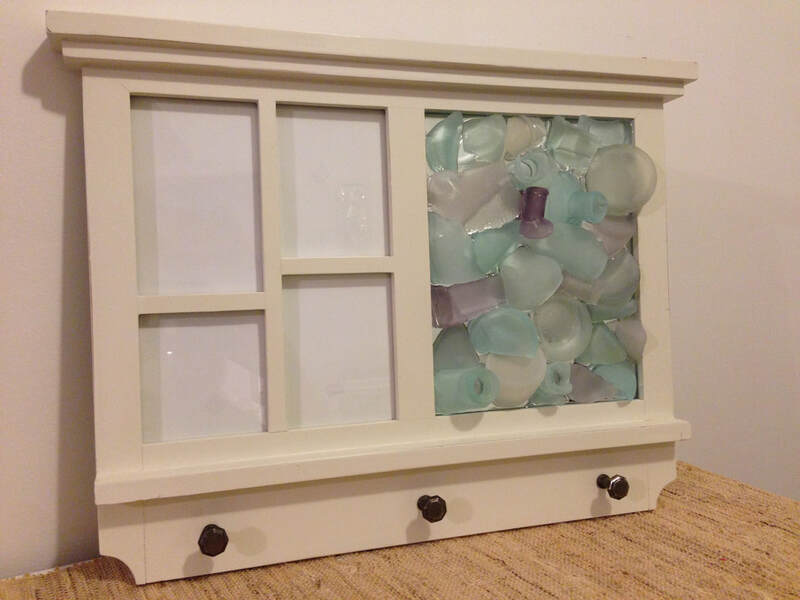 SOLD #18 Bay glassed, antique shades of purple with a smattering of soft whites. All soft and rounded edges. 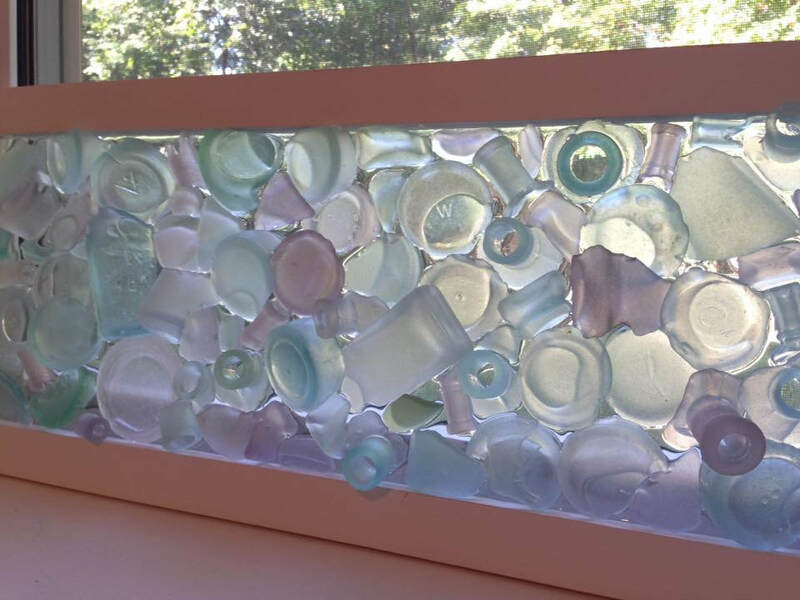 Most pieces originate from decorative glass table pieces. 13 x 11 frame size. SOLD #17 Soft aquas in a rough cut frame. Battery operated lights illuminate the piece with the flip of a small switch. Batteries are replaceable. SOLD # 16 The first amber, green, and brown piece! 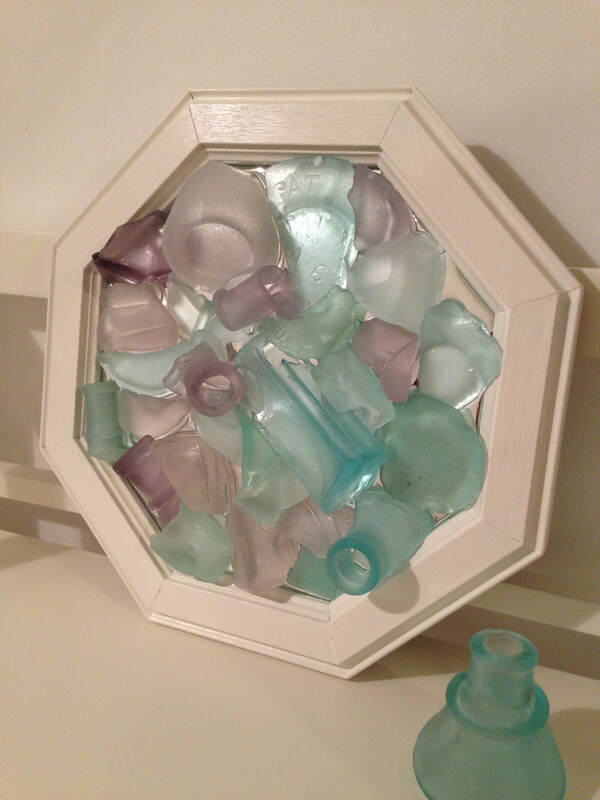 all pieces are softly bay glassed, a rarity for modern colors! 17 x 9 frame size. 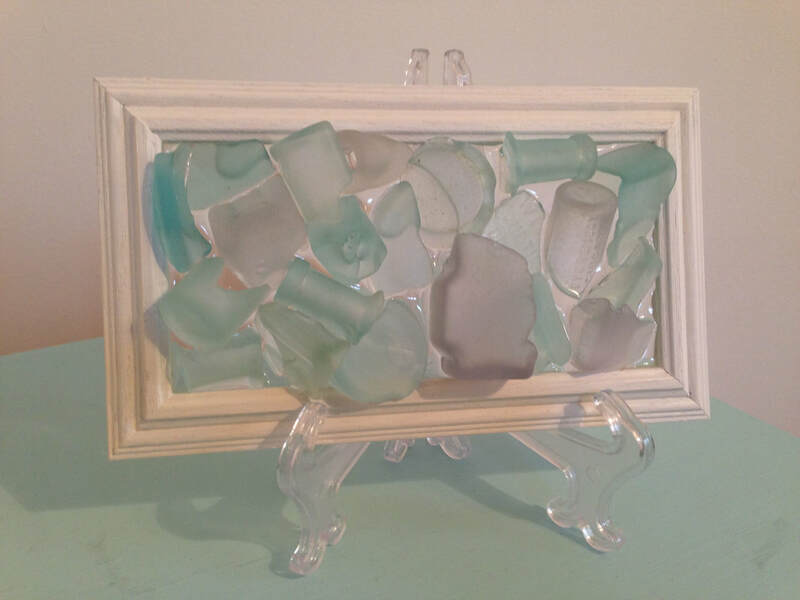 SOLD #14 Sea foam Bay Glass. 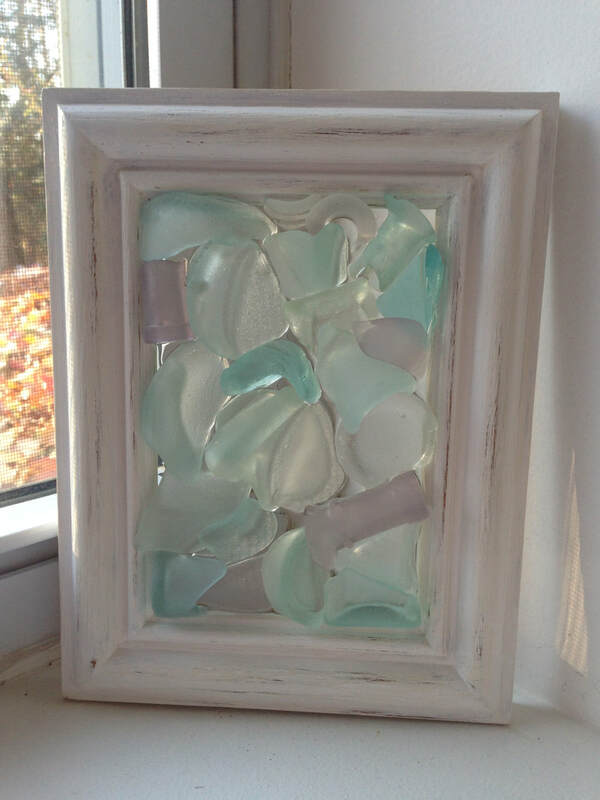 A beautiful addition to any beach room. Rounded edges on all glass. "Parilla," "Baking," and "Nov 27" visible on glass. Can be wall mounted or hung as sun catcher. 13 x 11 frame size. SOLD #13 Bay tumbled glass. All aqua blues. Visible "GHB" on bottle bottom and a piece of a druggist bottle from Baltimore, Maryland. Hardware mounted to be hung as a sun catcher. 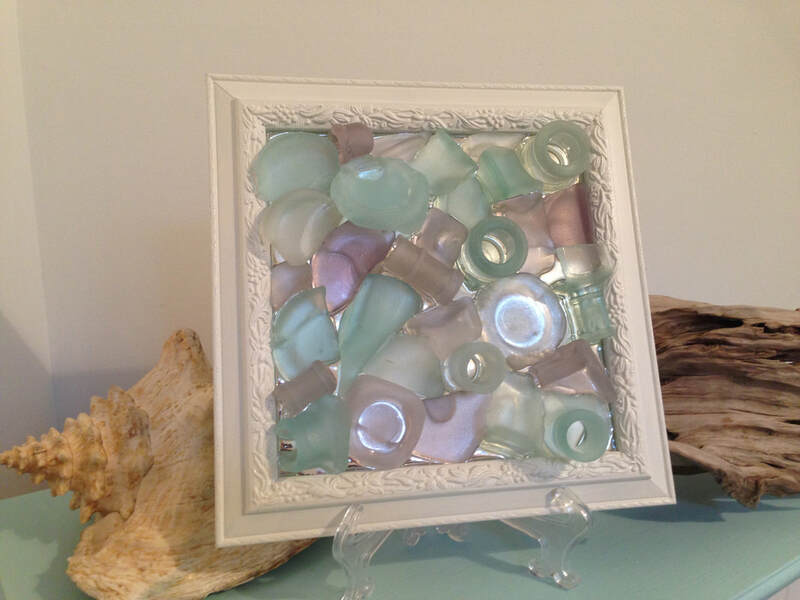 SOLD #12 Antique, wave tumbled sea glass mounted in 9 x 7 frame. Mostly medicine bottle necks and sides. Hardware mounted for displaying as a sun catcher. SOLD #11 Rainbow Bay glass in distressed frame. Displays best on white wall or as a sun catcher. 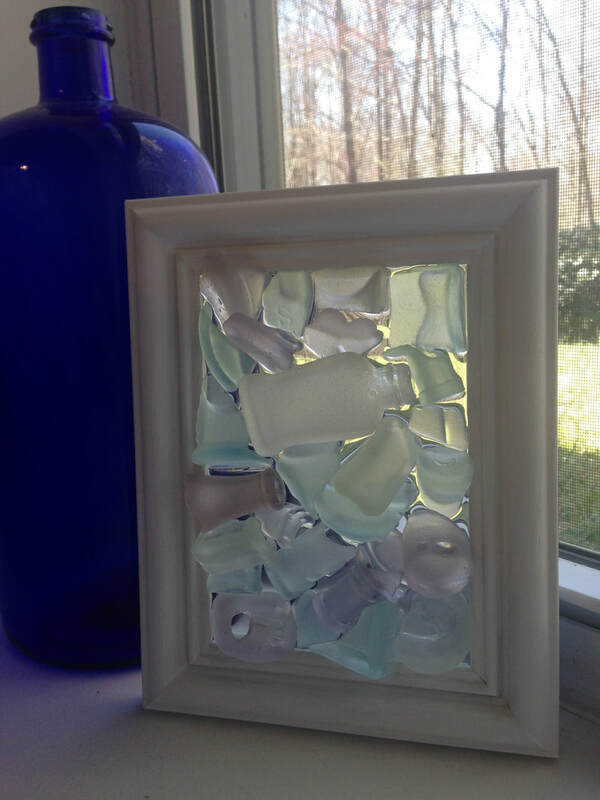 SOLD #10 Chesapeake Bay glass rainbow! 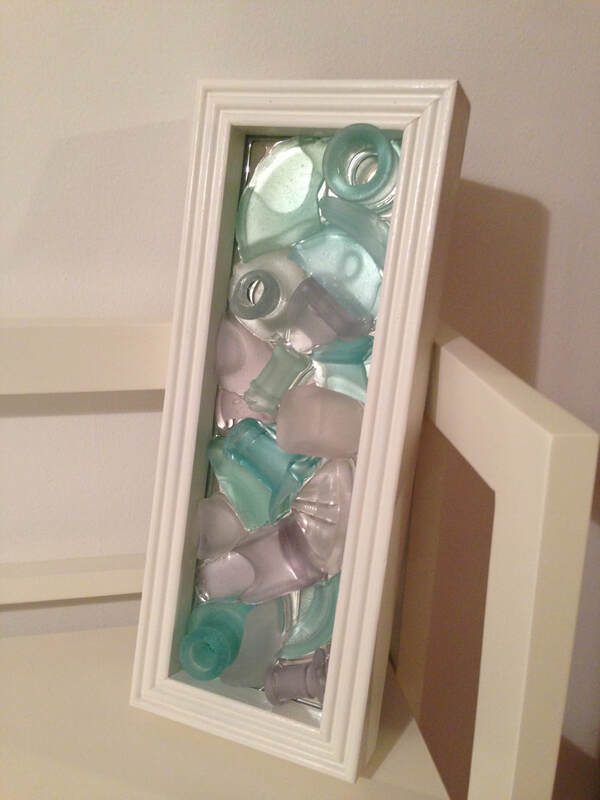 White, blue, green, and purple pieces of small medicine bottles. 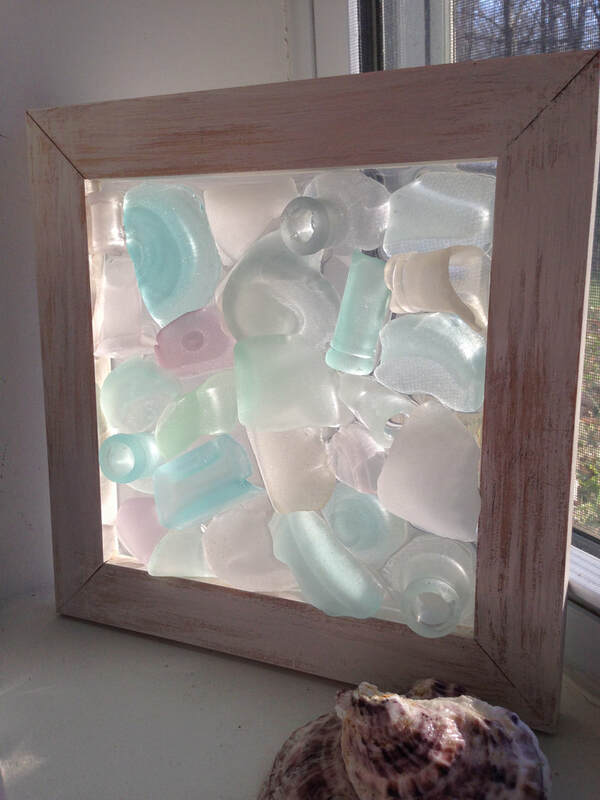 Displays best on a white wall or as a sun catcher. 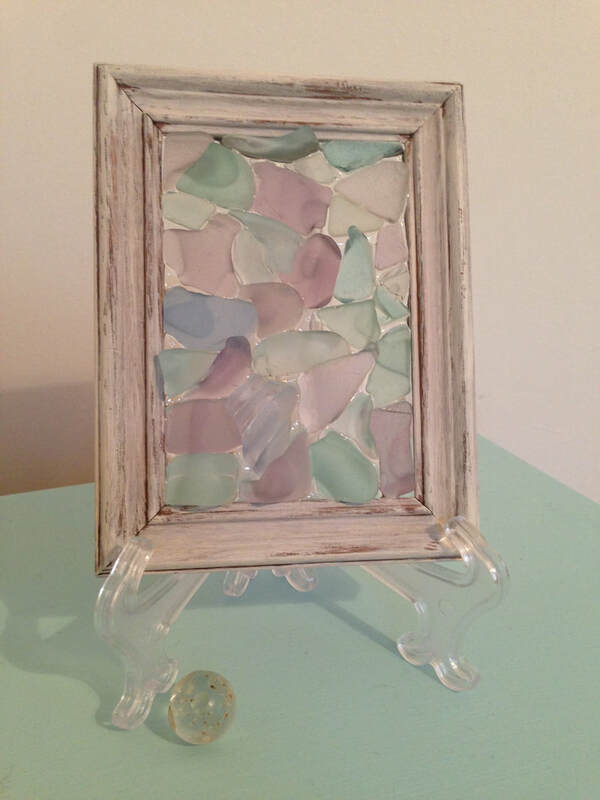 SOLD #9 Bay Glassed, pastel colored sun catcher. Also displays well on a white wall. All pieces are collected from the Chesapeake Bay and hand placed. 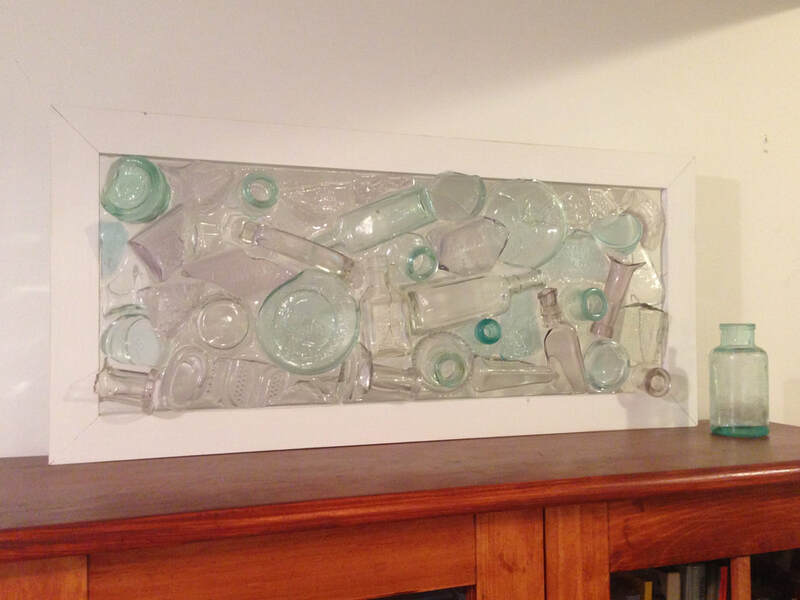 SOLD #8 Bay Glasses medicine bottle necks mounted on canvas. The colors are amazing and display well in any light. "Chesapeake Bay" handwritten on canvas. 9.5 x 7 frame size. 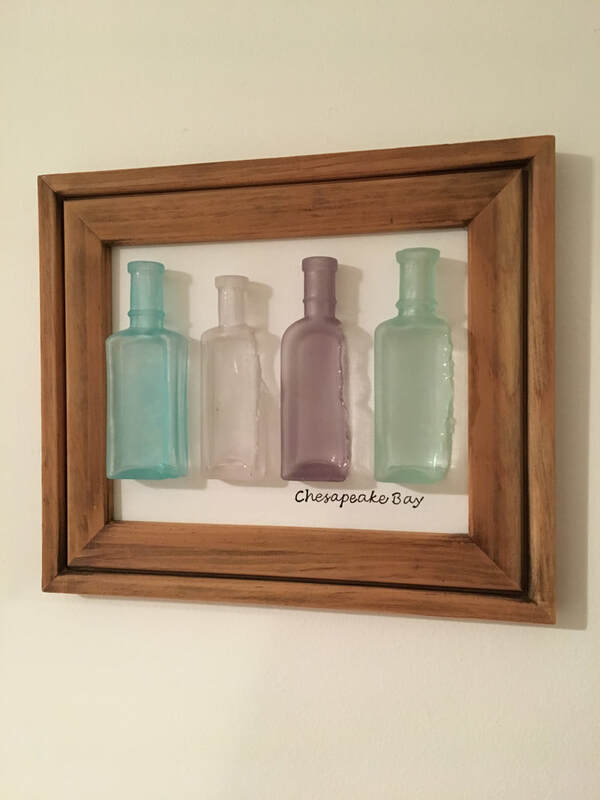 SOLD #7 Chesapeake Bay, wave tumbled baking powder bottle bottom. Deep purpled from manganese content reaction with the sun! "1" clearly visible on piece. Hardware for wall mount. 7 x 7 frame size. SOLD #6 Colorful pieces found in the Chesapeake Bay with unique words and markings. "Carter's 1897," "Nov 27," "Lowell," "San Fransisco," "G.111," "Specialty," "Boston," and "Pat." 14.5 x 11 frame size. SOLD #5 Soft pastels with rounded edges! Medicine bottles and baking soda bottles are soft green, blue, and purple. 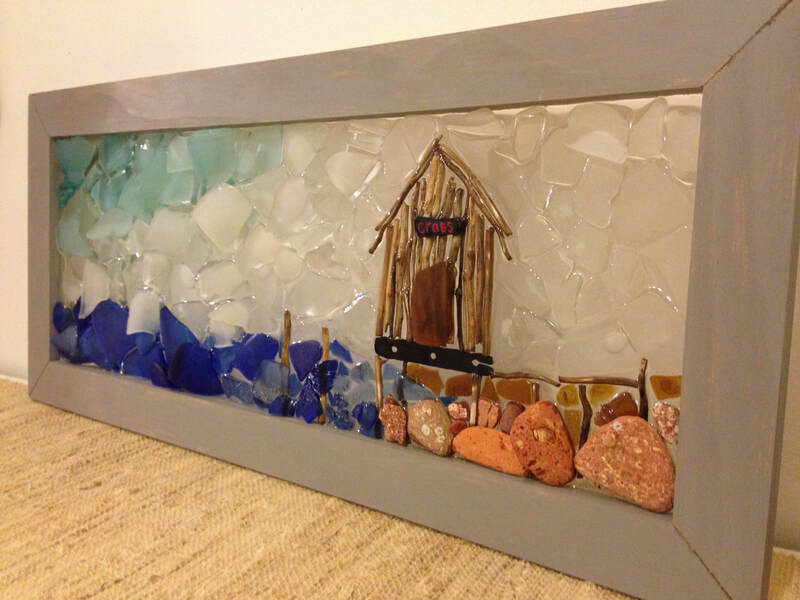 SOLD #4 Glass shards collected from the waters of the Patuxent River! Battery operated lights illuminate the glass from behind. Bottle embossings are legible with and without lights. "bottling Works, Baltimore, MD," "Taniac," "Tastless Tonic," "Medicine," "Baking Powder," "U.S.A." Caution: Sharp edges! 14.5 x 11.5 frame size. SOLD #3 Wonderful rainbow colors! Medicine, beer, and baking soda bottles. Deep purples, blues, soft whites, and greens. 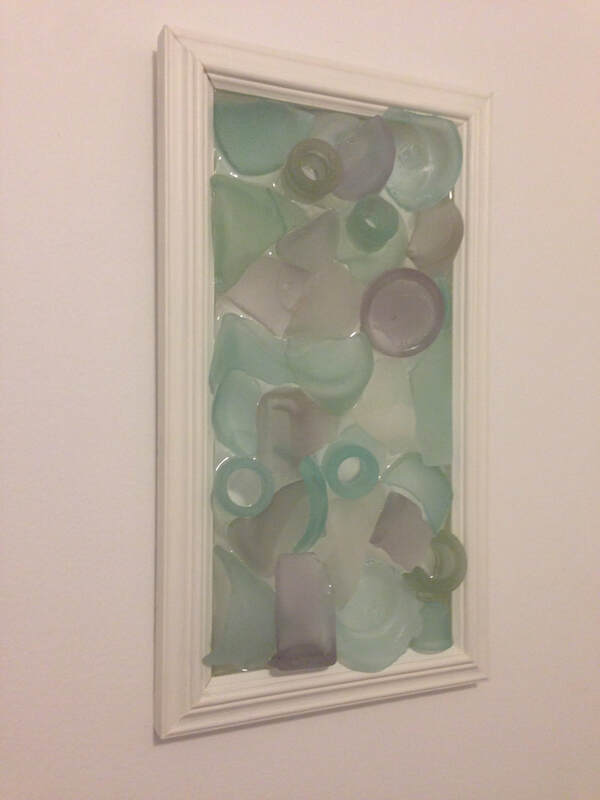 SOLD #1 Medium Bay Glass wall mount or sun catcher. All edges are rounded. Greens, blues, and purples.